The creation of the appliance begins with the grounded concept of function. The design must perform exceptionally and unfailingly. The designer’s vision facilitates this function, yet inspires so much more. It can challenge engineering, it can innovate, but only in order to genuinely benefit the design conscious private chef. This is functional objet d’art. At every stage of the production of Gaggenau appliances, a craftsperson examines their work using hand and eye, seeking imperfections. This constant quality control protects an exceptional reputation built by hand, since 1683. Ovens are the heart of the professional, as well as the private, kitchen. The capacious EB 333, sculptural 400 series and flush 200 series each provide extraordinary and distinct baking experiences. There are a multitude of striking and intuitive configurations available. For example, couple the combi-steam oven with the vacuuming drawer and add sous-vide cooking to your repertoire. Or complement your choice of oven with the warming drawer or combi-microwave oven. You are only limited by your imagination. As the kitchen becomes a place for both cooking and entertaining, ventilation becomes more vital. 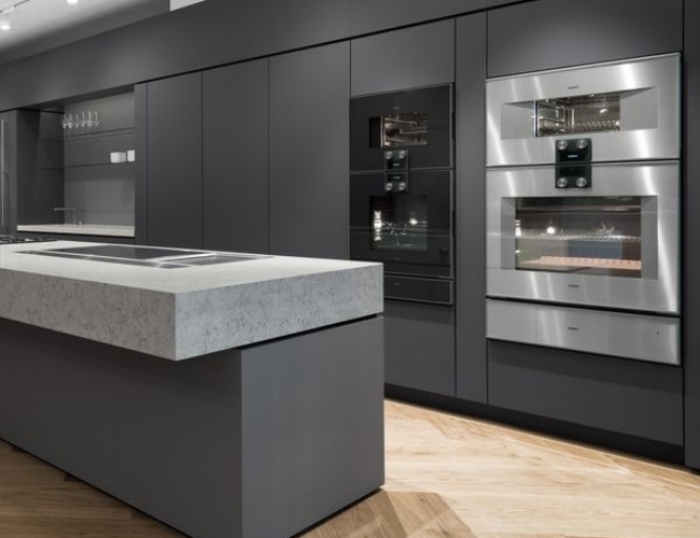 Effortless, silent and clever, the ventilation 400 and 200 series capture vapours and odours from a collection of extractors, which can be controlled manually or automatically, mounted on the ceiling, on the wall, within cupboards, above islands or on the cooktop. Everything has been designed with discretion and airflow in mind, creating a system that performs exceptionally and quietly behind the scenes. There is a cooktop for every space and each private chef. The versatility of flex induction, induction, gas or glass ceramic cooktops can be combined with downdraft ventilation and the more specialised electric grill, steamer, Teppan Yaki or deep fryer. Singularly or combined in the Vario models, all are crafted to inspire the private chef. Whether flush- or surface-mounted, the expansive, professional Vario cooktops 400 series or the compact, understated Vario cooktops 200 series will transform the cooking space.